I received a message from a friend today asking if I could identify this deck for them. Oh, I have that! 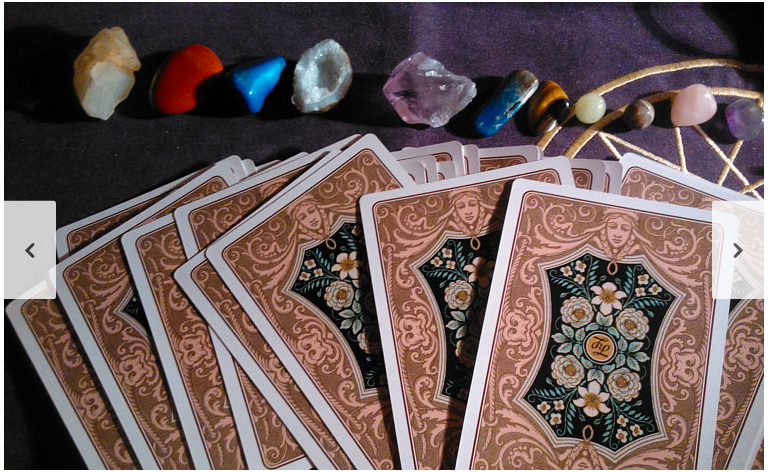 Those are tha backs of what is actually a Lenormand deck, not a Tarot. This is the French Cartomancy Lenny, and it was available along with a companion book in The Easy Lenormand Set by Katz and Goddwin. Yup those are the very cards I have. Oh, so the Easy Lenormand set and the Lenormand Oracle set have the exact same Lenormand deck, altho they have different companion books by different authors. Nice find, gregory! Thank you both, gregory and EmpyreanKnight! Here I hoped it was a really stunning tarot card back... hahahaha. By the way, the Lenormand Oracle by Tuan is quite something. I mean, most Lennies are playing card size, altho the French Cartomancy from the Katz set I have is a bit bigger than most. My eyes fairly bulged out of their sockets when the Aeclectic profile for the Tuan deck described it as about 3.5" X 5". I mean, really - that's bigger than most Tarot decks! In fact, it's the biggest Lenormand I've ever heard of. I wonder how the Grand Tableau with this would work out. I'm going to watch out for this set for when I get into my Lenormand phase. Laura Tuan does good stuff. Check her out. Her tarots are rather LARGE, too. Aye! Truer words were never spoken.